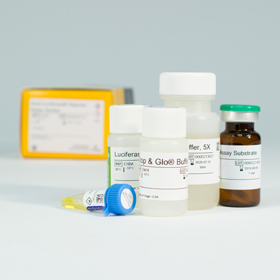 Detail The Dual-Luciferase Reporter (DLR) Assay System provides an efficient means of performing two reporter assays. In the DLR Assay, the activities of firefly (Photinus pyralis) and Renilla (Renilla reniformis or sea pansy) luciferases are measured sequentially from a single sample. The firefly luciferase reporter is measured first by adding Luciferase Assay Reagent II (LAR II) to generate a luminescent signal lasting at least one minute. After quantifying the firefly luminescence, this reaction is quenched, and the Renilla luciferase reaction is initiated simultaneously by adding Stop & Glo Reagent to the same sample. Both assays can be completed in about 4 seconds using a luminometer with reagent auto-injectors. In the DLR Assay System, both reporters yield linear assays with attomole (100ul/well), additional Passive Lysis Buffer may be purchased separately.